You want to benefit from cloud. You want to benefit from Agile, ITSM and DevOps. You want to save money. You create a programme and move your services and applications to some cloudy world. Whether it is hybrid or all someone else’s have you considered the impacted on your overall processes, all of your internal staff, your customers, regulators and suppliers? We find that many consider some of these but few look at the entire spectrum. Cloud is a great thing, especially when viewed from the lens of integrating your service with great management (SIAM). 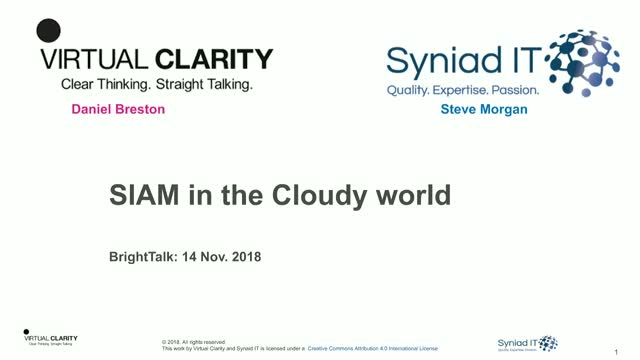 Please join Steve Morgan, Director SynaidIT and SIAM-ITSM coach & mentor, and Daniel Breston, Principal Consultant Virtual Clarity & DevOps ITSM blender, as we discuss (argue) the good, bad, great of SIAM in the Cloudy world.